Helen Ruby Anne Marney-Veres (nee McLellan) of Bible Hill, age 78, born in Chaleurs, Quebec on January 2, 1940, beloved wife of John Veres went to be with her Lord and Saviour on Friday March 2nd 2018 at 5:45pm at the Colchester East Hants Health Center. She was the eldest child of the late Erwin & Pearl McLellan. Helen lived most of her childhood on the Gaspé coast. She moved with her family to Truro at 15 years of age and there she spent the rest of her formative years and attending the Colchester Academy where she graduated in 1957. Her new home became Truro, Nova Scotia which she enjoyed immensely, but her heart never left the Gaspé. Helen embarked on her banking career at the Royal Bank in Truro shortly after high school. 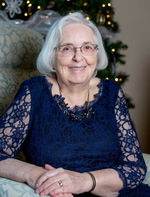 She married Lyman Marney in 1962 and moved to Prince Edward Island where they lived for 16 years, returning to Truro as a family when Lyman secured a job with the Federal Government of Canada. Helen was a very social person and was well known and well loved by those that worked with her at Statistics Canada and by the thousands she served while working at various banks over the years including the Royal Bank in Truro and PEI, The Bank of Commerce in Charlottetown and later at Montreal Trust, which merged with Scotiabank where she finished her career when she retired in 2005. Helen was great with numbers and great with people, which made her a valuable asset to the Bank. It was said that she helped build millions of dollars of wealth for her clients, and as a result contributed disproportionately to the success of her branch and the bottom line of the Bank. She did free tax preparation for friends and family for years after her retirement. Helen had the opportunity to fall deeply in love twice in her life. After Lyman went to be with the Lord in 2011, Helen moved into Edinburgh Hall at the Parkland Shannex in Truro, where she would eventually meet John Veres and after a romantic courtship they were wed in Edinburgh Hall in January of 2016. Both of them having had lost their spouses after many years of marriage, this new relationship gave each of them a new purpose in life and it was beautiful to see the depth of love they held for one another. Helen loved her family, children, grandchildren, friends, neighbours and colleagues and customers. Even in her fading days, she would remember the birthdays of her friends’ children and similar details from many years ago. Predeceased by her husband, Lyman, of 48 years; she leaves behind; loving husband John Veres; children, Rod, Greg (Suzanne), Geoff (Beth), Denise (Joe); grandchildren, Sarah (Neil), Kerry, Jennifer, Matthew (Michelle), Melissa (Greg), Meggan, Kyra (Biays), Stephanie, Jonah, Svetlana (Spencer), Celeste, Jane, David, Laurel, Sam, Avery, Isaac, Stephanie, Tessa, Mike and Chris; loving sister to Ruth (Merle) Bigney, and David (Mary) McLellan, nieces and nephews and John’s children and their families, John Veres Jr. (Marie), Dianne (Ron) McKeag, Sandra Dyer Veres, Wanda (Aubrey) Watson, Joe Veres (Tamara Fraser) (Son: Nick). The family would like to express heartfelt thanks to the entire team at Parkland, Shannex in Truro, Valery Kerr and her colleagues and the staff at Earth Angels, who demonstrated a remarkable duty of care and devotion. Also a very special thank you to Dr. Rowe in Truro and appreciation to Dr. Boudreau and the staff at the Aberdeen Hospital in New Glasgow as well as to the doctors and care workers at the Colchester East Hants Health Center in Truro for their exemplary care of Helen. Family flowers only. Donations, in lieu of flowers, may be made to MSC - Canada, 101 Amber St., Suite 16, Markham, ON, L3R 3B2 or to the Colchester East Hants Health Centre Foundation, Truro. Visitation will be held from 6 – 8 p.m. on Wednesday, March 7 with a celebration of Helen’s life at 2 p.m. on Thursday, March 8, both in Colchester Community Funeral Home, 512 Willow St., Truro with Pastor Ken Fillmore officiating. Reception will follow the service.